The Pacific Institute is pleased to announce the launch of the Congressman George Miller Water Policy Leadership Program at the Institute to support two water policy interns annually for the next five years. 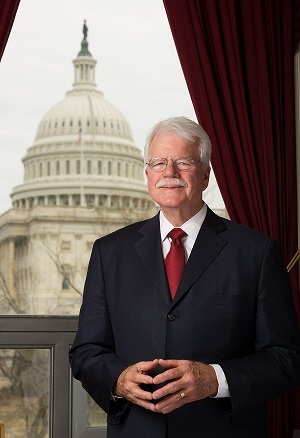 This program was established to honor the long service of Congressman George Miller to his country, and his legendary dedication and historical accomplishments around sustainable solutions to Western U.S. water policy reform. Congressman Miller served in the U.S. House of Representatives from 1975 to 2015 representing California’s 11th congressional district. He was a long-time member of the House Natural Resources Committee and served as that Committee’s chairman from 1991 to 1994. He supported efforts to preserve public lands such as the 1994 California Desert Protection Act, which among other things created the Mojave National Preserve, and expanded Death Valley National Park and Joshua Tree National Park. In addition, Congressman Miller was the chief sponsor of the Central Valley Project Improvement Act of 1992 (CVPIA), which mandated that the federal Bureau of Reclamation manage the Central Valley Project in order to better protect the fish and wildlife populations of California’s Bay-Delta region. He remained on the committee as a member until 2015 and is considered to have been the most knowledgeable and passionate congressional representative tackling sustainable water policy issues. The Pacific Institute, founded in 1987, creates and advances solutions to the world’s most pressing water challenges. We select and supervise a small number of interns each year, primarily focused on western water issues. These interns typically work during an eight-week period on sustainability or other resource topics. Selection of the interns is based on criteria outlined by the Pacific Institute, and the purpose of these internships is to provide each intern with significant and varied experiences to build skills in research, outreach, and leadership; to benefit from a committed mentor; to have the opportunity to connect with other professionals in the sustainability field; and to accomplish a specific project(s) that also contributes to her/his resume. Interns receive a modest financial grant and gain experience working in a nonprofit organization, including such tasks as reading and analyzing academic reports and other literature, analyzing data, writing reports and related materials, conducting internet and field research, assisting in outreach, giving presentations, and connecting with others in the field.